and hopefully I'll be a able to post a bit more regularly now that summer is over. I gotta say this look was a good one to return with. Total 70's vibe but modernized with the choker. 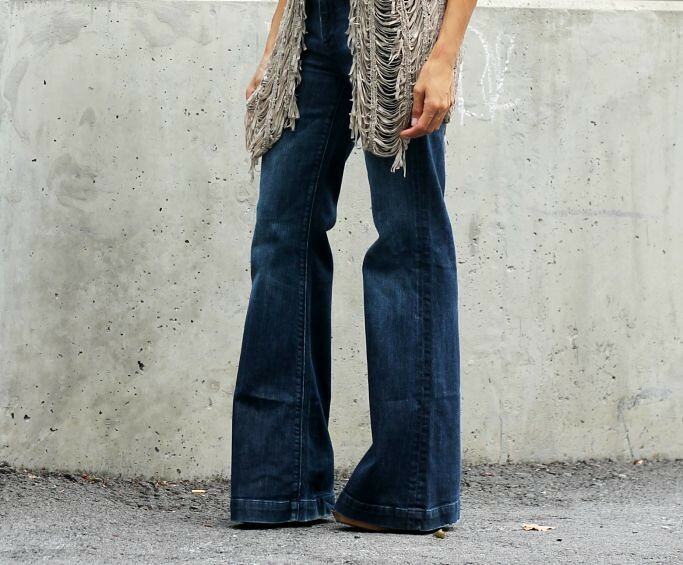 There is a lot of fringe out there night now, but this torn fringe vest is KILLER!!!! The longer length gives it an easy vibe and the flares just really complete the whole look. This entry was posted on Saturday, September 5, 2015 and is filed under flares,fringe,fringe vest,leather backpack. You can follow any responses to this entry through the RSS 2.0. You can leave a response. Such a unique vest. So cute!! Ugh, love this look! I'm such a fan of 60s/70s fashion and this is beyond! I'm glad I'm not the only one who fizzled out on posting during the summer. I'm finally back on track! That vest is awesome, you always find the best stuff! Lovely photos! What did you use to capture them?